professional weepers for their tragedies. they planted them in the first row. the last-minute cues of the prompters. what was realism, what was ruse. Walking home from the theater she kept crying. Odile staggered sob-blind into strange men, gendarmes. trailing flamboyant souvenirs of theater days. But who ever leaves any sorrow behind? what could I do to quell her tears? What lines could I say? Justin Vicari is a poet, critic and translator. He is the author of Male Bisexuality in Current Cinema: Images of Growth, Rebellion and Survival (McFarland, 2011). His work has received the Third Coast Poetry Prize among other awards. 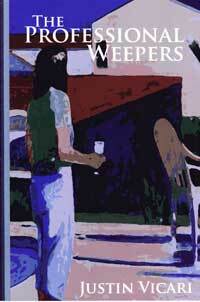 The Professional Weepers is his first full-length collection of poems.